Bolt’s streamlined oscillator design makes synthesis straightforward and fun, and delivers the goods sonically. Call us cynical, but we learnt a long time ago that when a software instrument developer tells us it has ‘invented a new form of synthesis’, what it usually means is a different way of coming up with essentially the same sounds we’re already making with our old-hat analogue-and digital-style synths. Bolt (VST/AU), the first software instrument from renowned MIDI controller manufacturers Nektar Technology, makes exactly that claim. It turns out, though, that in this case, the novel architecture does bear fruit in terms of workflow and usability, as well as a certain character and clarity of sound that we really rather like. Nektar’s new technique goes by the name ‘harmonics synthesis’ and, similar to additive synthesis, it enables the final frequency-shaped waveform to be created entirely within the oscillator, doing away with the need for a filter. Each of Bolt’s two oscillators directly generates a series of sine wave harmonics, the amplitude profiles of which are broadly adjusted using the Harmonics and Rolloff knobs to define their output waveforms - see Harmonics synthesis. Activating the Deep button boosts the lower harmonics, ‘fattening’ the waveform and pushing it more towards a saw shape. The Odd button sets the oscillator to output only odd harmonics, and when the Deep function is also active, the result is pretty much a square wave. Oscillator 1 can also have FM (via a dedicated sine wave oscillator) or cross-modulation by Osc 2 brought to bear; and the DYNX control applies a sort of ‘loudness’ effect, giving the higher harmonics a hefty kick up in level. The bottom section of the interface provides access to up to four unison voices with Detune and Width offsets; per-oscillator Glide; and adjustment of polyphony from Mono to 16 voices. Cooked up by Nektar in collaboration with Hamburg’s Helmut Schmidt University, Bolt’s method of synthesis generates the final waveform (as it would appear post-filter in a subtractive synth) directly in the oscillator using just two controls. Each oscillator outputs a ‘pulse train’ of harmonics, the shape of which is modulated by the Harmonics and Rolloff knobs. Harmonics is analogous to a filter’s cutoff frequency control, attenuating all harmonics when fully anticlockwise, so that just the fundamental is heard, and increasingly raising the levels of the harmonics to the right as it’s turned clockwise. The steepness of the amplitude slope is defined by the Rolloff knob, which can be set to sound like a response of anything from around 6-60dB/octave. Of course, those aren’t actually Bolt’s only important oscillator parameters, as the Odd and Deep buttons also have a profound effect on the harmonics, enabling squares, saws and other waveshapes to be invoked. In general terms, harmonics synthesis is similar to additive synthesis. The crucial difference, however, is that here the harmonics are generated by a single oscillator, as opposed to a bank of them, as is the case with additive. By playing around with the Harmonics, Rolloff, Deep, Odd and FM/XM controls in the two oscillators, and balancing and panning them, a rich and diverse spectrum of combined waves can be conjured up. Each oscillator also features an ADSR amp envelope; a sub-oscillator, mirroring the waveform an octave below; and a strangely presented Drive control for great-sounding per-voice distortion. Beyond the oscillator amp envelopes (which can’t be reassigned), Bolt offers a fair amount of modulation in the shape of three LFOs (in a tabbed panel) and an assignable ADSR envelope. Each can be hooked up to four target parameters from throughout the synth, although, disappointingly, these don’t include the effects controls (see below), which could have been useful for filter-style EQ modulation. MIDI velocity can be used to modulate the Attack and depth of the Mod EG; and the uni/ bipolar LFOs feature phase shift, fade-in, one- shot mode, envelope retriggering and a couple of ‘step’ waveforms to aid construction of faux sequences. The LFOs and Mod EG can modulate each other, and with the LFOs running at up to 10kHz, all sorts of crazy effects are on the cards. The Modwheel (two targets) and Aftertouch (one target) are assignable in the lower section. Finally, four simple effects modules are on hand for buffing-up and transformative processing. The one-band EQ switches between peak and band-pass behaviour; the Chorus sounds wonderfully lush; the analogue- modelled Delay feeds back in mono or stereo and syncs to tempo; and the Reverb includes a Tone control, and applies compression when the Size parameter is set towards its maximum. What we find most remarkable about Bolt is how intuitive it is, thanks to the brilliant operational simplicity of the oscillators and its zippy (and freely resizable) one-window interface, which - tabbed LFOs aside - keeps every parameter, modulation assignment and effect in view at all times. The Harmonics and Rolloff knobs invite tweaking and modulation, and small adjustments to them can have a big effect on the sound. The toggling oscilloscope/spectrogram display is perfectly informative, too, letting you see what’s happening to the waveform and harmonics as you alter them - but it’s a shame the same can’t be said of the modulation system, which doesn’t give any visual indication of parameter movement. Other than that niggle, we don’t really have much in the way of criticism. If we were to pick a couple of nits, another modulation envelope wouldn’t go amiss (the LFOs can be substitued in one-shot mode, but that’s not quite the same); and while the effect of moving the Harmonics and Rolloff controls is similar to low-pass filtering, it can’t be made to spoof a high-pass, band-pass or notch response. In practise, we didn’t find this last to be a major issue - and the EQ has a band-pass option - but for certain types of sound, those modes might be missed. Ultimately, while Bolt’s approach is unique in terms of specifics, it isn’t a gamechanger: this is a two-oscillator synth that won’t recalibrate your expectations of what such an instrument can do, sonically, in any sense. 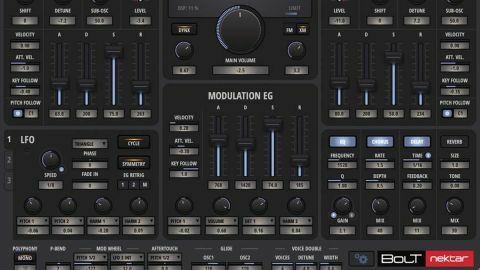 But that’s not really important - what matters is that this affordable plugin is supremely easy to get to grips with, and boasts a powerful, focused sound that’s ripe for the programming of impressive basses, leads, keys, pads, FX, percussion and anything else you could ask of a quality synthesiser.